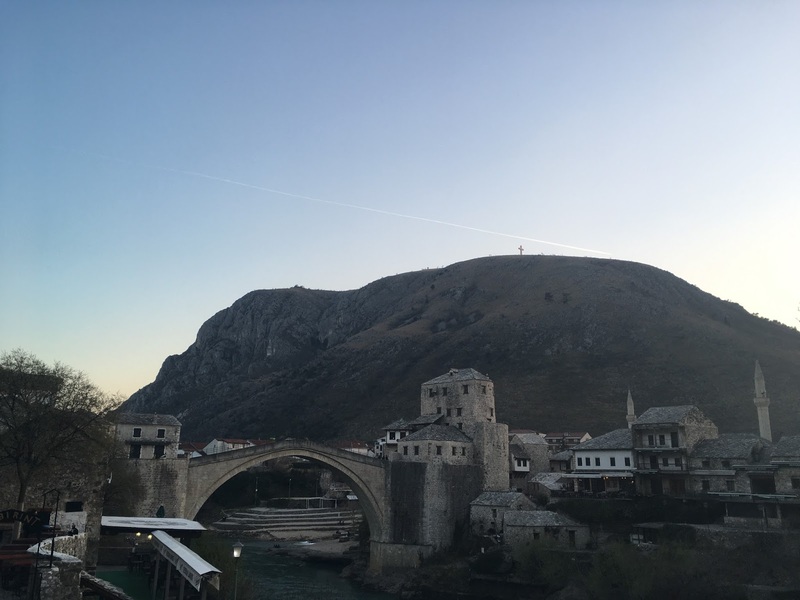 Mostar is famous for its Old Bridge. The most interesting thing about the bridge was the choice of rocks for its restoration. It had a white smooth surface that was designed to slip the freak out of people. On a hot sunny day, we glided; not sure how slippery it gets when wet. The ascend was okay, but downward slope was tricky, even with the small stilts to break the slope. In fact half of the old town was covered in polished cobbles. 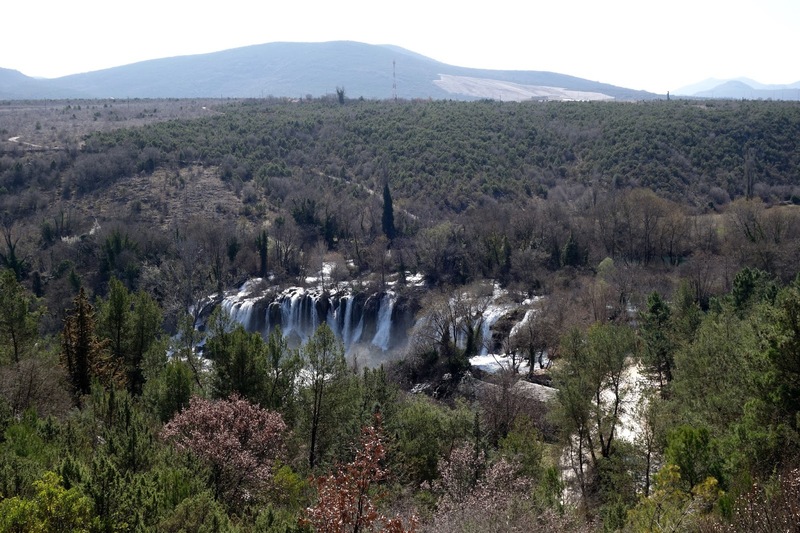 The next day we did a short drive to Kravica, or Kravice waterfalls. The 45mins drive through a few towns was very enjoyable, except for the nervous moments of crossing a very narrow and rusted bridge, where there was constant incoming traffic but we weren't convinced the bridge could hold 2 cars. There were only three other cars at the waterfalls - I love travelling low season. 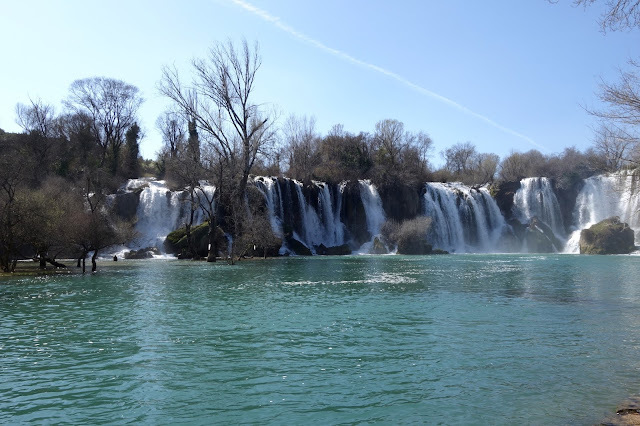 Despite having seen 3 waterfalls already, Kravice falls was still pretty cool. 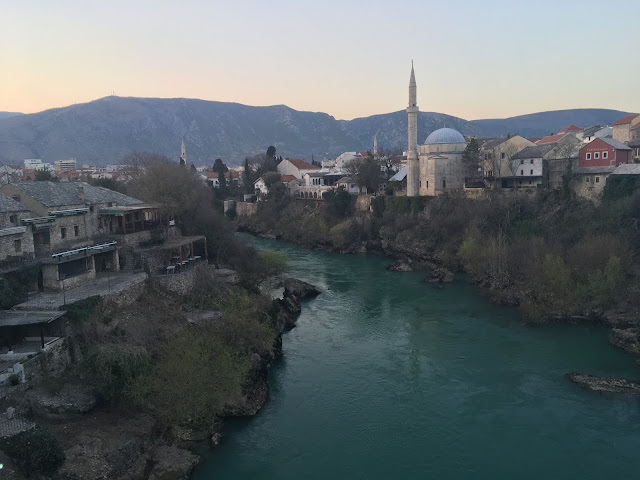 Then we went back to Pocitelj, a tiny town by the river. When we entered the gates, our first reaction was: Game of Thrones - the winding cobble pavements reminded me of Cercei's walk of shame. 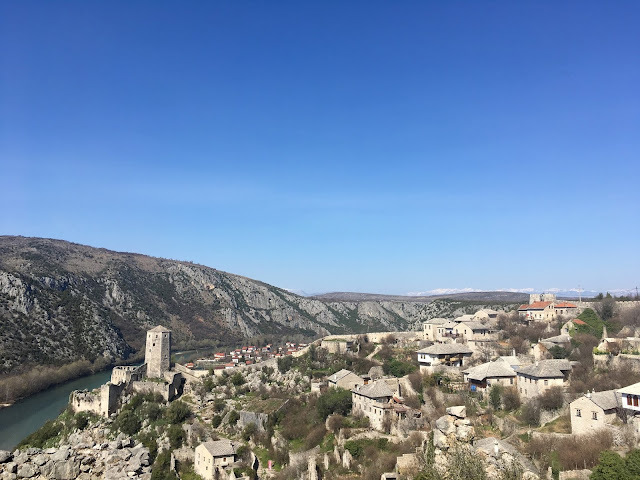 The sleepy town was charming and serene; we climbed to both sides of the fortress walls to take in the view of the fortress, and from there a great view of the turquoise river that meandered its course around the rolling mountains. This was one of our favourite places of the trip. Perhaps it was low season, none of the restaurants were serving food. So we pumped our tank and headed to Blagaj for lunch. To stretch our legs, we parked well out of town and walked towards Devish House with an empty stomach, hoping to run into a more local restaurant not targeting tourists. There weren't any. Just ended up at the first one by the river. Interestingly the menu was identical to the ones we saw in Mostar old town, just 20% cheaper. He had grilled trout caught locally at the river and I had a burger... coz I didn't want a lasagna. The fish was delicious, soft and succulent. The Devish House was a bit meh. Not that much to see but I suppose it'd be a good short trip from Mostar. We sat by the waters before heading back. 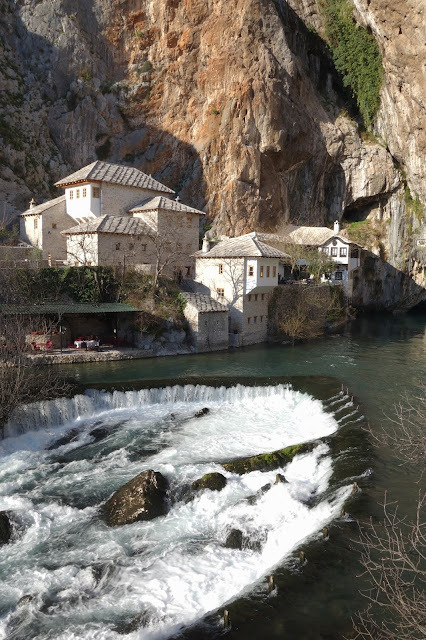 We wanted to stay away from Mostar Old Town, just weary of the same touristy crap. So we walked to the new city centre, passing some very run down buildings right next to spanking new governmental ones. The contrast was very interesting. 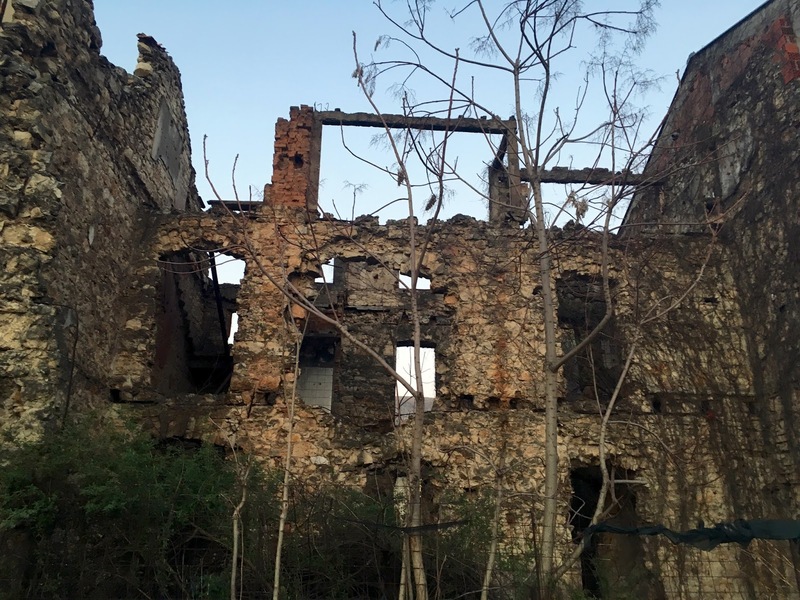 We thought back to what Neno said in Sarajevo, perhaps the authorities couldn't identify the legal owners, just the city just lacked financial resources to renovate. We popped into a local bakery and had a super juicy meat burek fresh off the oven. Definitely high on the list of best burek - I think it just has to be eaten hot. 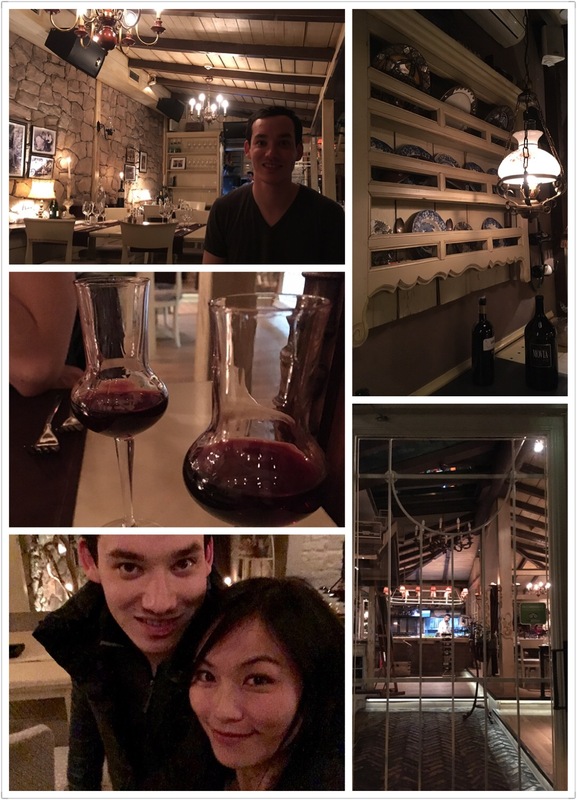 We waited for a table at Del Rio, which was fully booked on the Friday night. It was a modern restaurant with live music, clearly popular with locals for dates and small group gathering. There were good modern European dish options as well as some traditional stuff. We went for grilled pork medallion topped with caramelised onions and mozzarella and grilled lamb chops. Though not exceptional, it was very good - both meats were tender and well-seasoned, much better than what we had in the old town area. More importantly it had a great vibe and was good fun. The following morning we made our way back to Sarajevo after breakfast in the apartment. Before stopping briefly at Konjic, we drove past Jablanica where it was famous for the broken Neretva Bridge that was re-built by a movie company for their shooting. The original one was destroyed twice as a ruse and in a battle back in 1969. We could see the broken bridge dangling from the cliff from the roads, and there were a couple of viewpoints on the way. 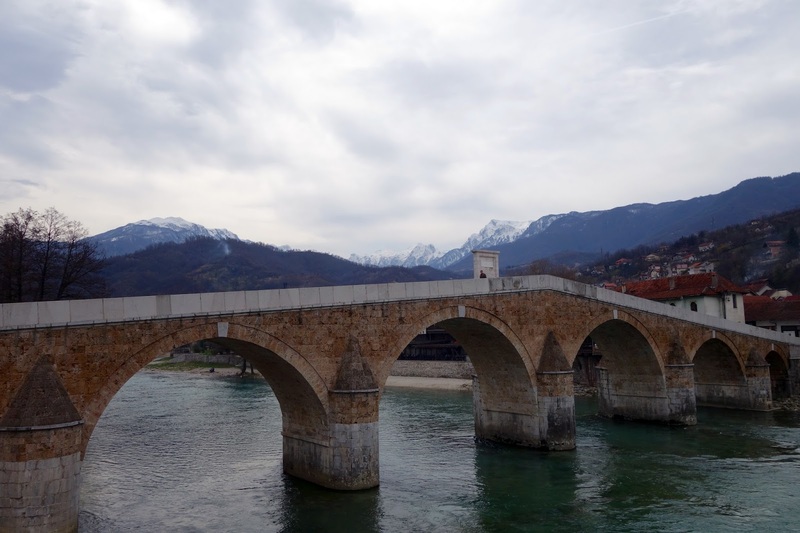 Konjic is a small town and we stopped for toilet and snacks. The weather wasn't as glorious as it had been, so despite the glacier in the background, the old bridge was... like any other bridge. The last 20min drive into Sarajevo was on a tolled expressway, with no other vehicles in sight. Needless to say he enjoyed driving that part the most. 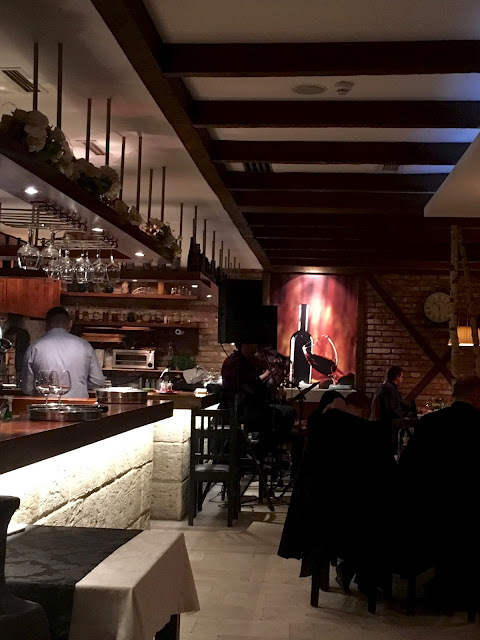 After dropping off the car and marvelled at the miracle of completing the 4-day road trip unscathed despite a few heart-stopping moments, we hopped on the tram back to city centre to check in. We went to Zara iz Duvara for less touristy fare. That street was lined with small makeshift wooden shacks that ranged from small cafes to street foods to small eateries. 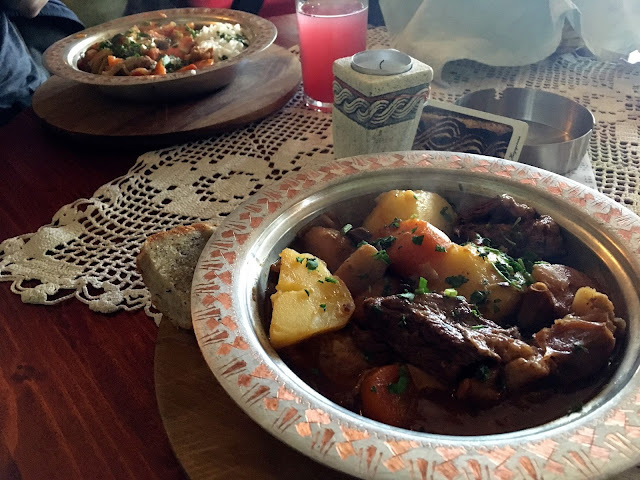 The Bosnia stew and veal stew were delicious, hearty and flavoursome, and the friendly host chatted to us about hiking options in Bosnia as we wolfed down the food. Then we walked back to Old Town for desserts. It's been a week in Bosnia and we had not tried any baklava. There was a particularly famous baklava boutique called Dućan Bazaar, and they offered a traditional Bosnian baklava called Zhandar. The guy explained this particular type of baklava takes 4 days to hand make from scratch with hand-stretched filo pastry, and there is no written recipe for it, so very few shops still make them. It was indeed very special. 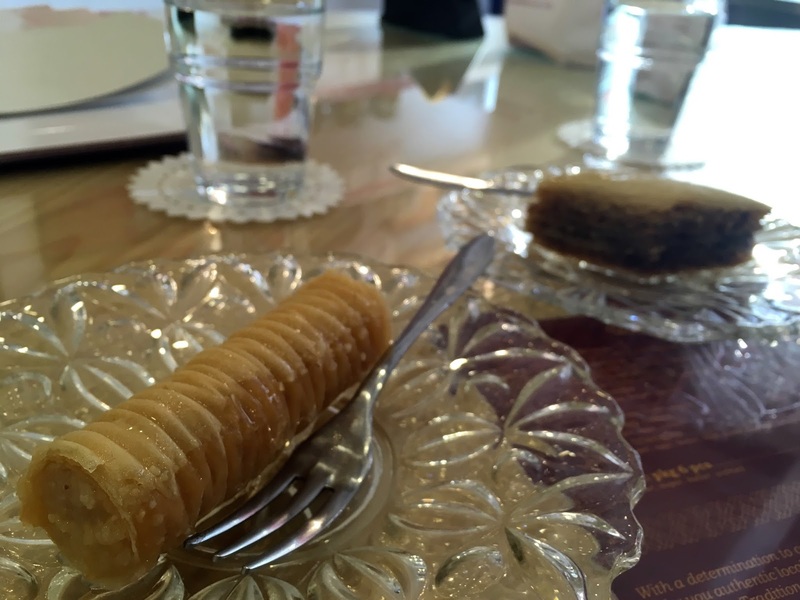 The layers of filo pastry flaked and dissolved in mouth into buttery fragrance; it was so airy, like a breath of honeyed butter, followed by nutty perfume from toasted crushed walnuts, moistened by a thin layer of sweet kaymak (cream cheese-like). It was perfection: just sweet enough and not drowned by honey, good ratio of pastry and nuts. At £2 a pop it's like Pierre Herme macarons, the jewels of desserts, but well worth the money. He then went to see the Genocide exhibition in the centre of town. I gave it a miss as these graphic images are too impactful for me. He said it was a very interesting exhibition though, some explanation on the Srebrenica massacre and a few modern art pieces from the darker days during the siege. 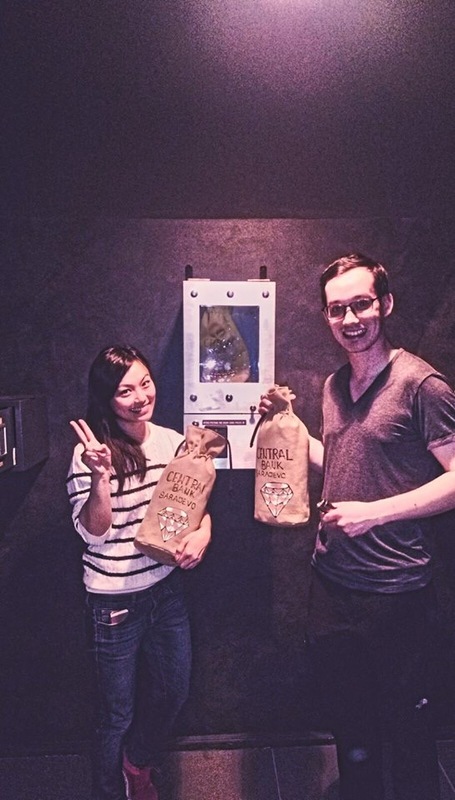 After a short break, we were pumped for our second Escape Room challenge of the trip. We did one in Belgrade and aced it. So this time we picked the hardest one on offer, called The Bank Job. Our host said success rate was 25% for teams of 4-6, and said we should probably try something easier like Fox in a Box as there were only two of us. Nah. We're up for it. Dinner was booked at The 4 Rooms of Mrs Safije. And I'm so glad we went - it was a stunning restaurant; the cosy country-house style dining room was warmly adorned with chandeliers, wine-lined walls and shabby chic cabinets. The attention to detail was meticulous. While his starter soup was good but not amazing, my scallop starter with saffron rice was beautiful, creamy with oceanic sweetness amplified by crispy seaweed salad. The lamb roulade was tender with a good rind of milky fat, paired with crispy potatoes. His monkfish fillet was firm but succulent, worked well with the shellfish bisque and grainy pea puree. All washed down with more big rounded local wines. It was a perfect dinner. On our last day we had breakfast at the new city centre shopping mall before catching the bus to Tuzla. 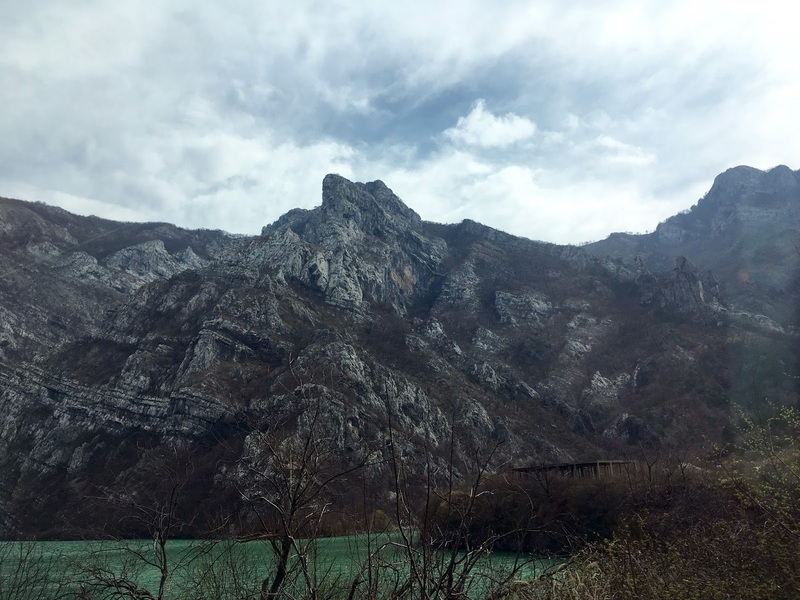 The 3hr bus ride was uneventful, not much to see now that we have driven along more exciting landscapes. The bus stopped near the huge shopping mall, about 10min walk from the town centre. We had to catch Bus 11 to Dubrave, then walk for 15mins to the airport. Since we couldn't really work out the bus timetable (but it seemed relatively regular), we decided not to bother with the town centre and had some lunch at the food court in the mall. The airport was cute - the shopping mall was definitely bigger. Even though we managed to buy a stamp, had a postcard from the walking tour, we didn't quite factor in the lack of a post box in the airport... so he charmed a guy at the car rental booth to post it for us - and it arrived today! 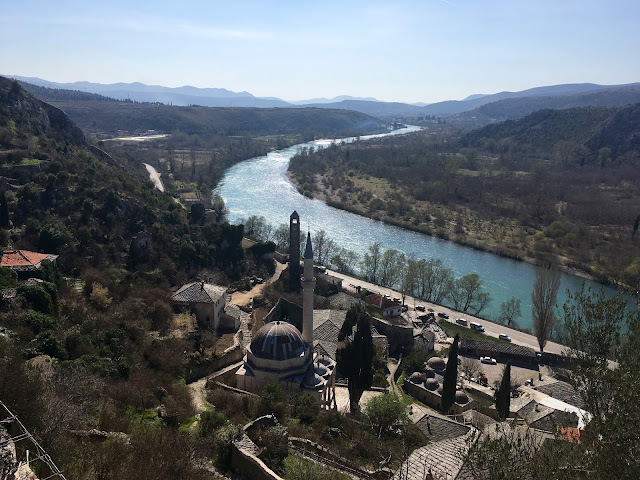 Our week in Bosnia and Herzegovina was incredible, absolutely sensational. The landscape has been breath-taking, people have been more than friendly, stories and history of the country tragic but compelling. Possibly one of my favourite places in Europe.